This week Joanna Johnson is here to tell us that even the busiest spinner can take time to participate—nay, compete—in the upcoming Spinzilla, taking place October 6–12. Places are filling fast, but we still have a few for Team Spin-Off! Sign up for a team or join as a Rogue Spinner. This year’s competition is open to spinners all over the world! Last year, a behemoth intruded into my life for one week. I first heard of Spinzilla while attending the summer TNNA (The National Needlework Association) trade show in Columbus in June. While heading out of the show floor one day, I walked right by the great wall of fiber and had to stop to touch and feel the scrumptious fibers. There I read about the upcoming Spinzilla event and admired the logo—a cute and fluffy white sheep encouraging us to “share the joy” of handspinning. What I failed to notice, however, was the enormous size of the slightly crazy-eyed sheep, and the fact that it towered over a medium-sized city of skyscrapers. 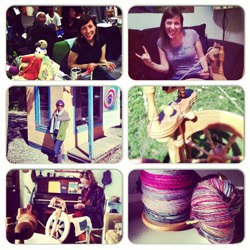 Joanna’s Spinzilla Instagram Adventures. Photo courtesy of Joanna Johnson. Taos Wool Festival and was well stocked). Fiber prepped and ready to go? Check! What I completely forgot to budget for was time. During Spinzilla week I had company in from out of town and a book deadline and a manuscript to mail out, along with running a craft booth at the annual fall festival at our children’s school. Oops. Spinzilla week arrived, and I manically sprang from activity to activity. Edit patterns. Spin some yarn. Throw dinner in the oven. Spin some yarn. Pack up yarn and books for the craft fair. Spin some yarn. Review color correctness of book proofs. Spin some yarn. Sit and visit with out-of-town company while I . . . spin some yarn. It was a crazy week and passed by in a dizzy blur. I desperately wanted to go down to Denver for the spin-in at Fancy Tiger, but an hour of driving time each way was too much precious time to allocate to driving rather than spinning. I spun at home, I spun at the coffee shop. I spun alone, I spun with a friend. I spun inside and outside, all the while letting the dishes and the laundry, the bills and the paperwork pile up. For a moment here and there I was able to share photos and keep up with everyone’s progress via hashtags on Instagram. Somehow—somehow, I managed to spin 3,836 yards that week. Team Fancy Tiger for the Win! Photo courtesy of Fancy Tiger. You may already know the happy ending to the story—that the Fancy Tiger folks were the Spinzilla champions and boast the golden niddy-noddy. 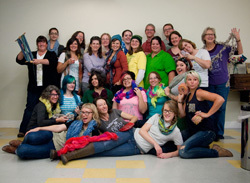 My book got done, my company had a great time, the craft fair was a success, and I caught up on my housework. For one week, spinning took over my life, and I can’t wait to do it again. This time I will be sure to clear my calendar for the week so the spinning monster can devour me in peace. 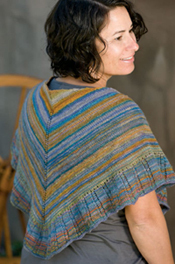 Joanna Johnson is the author and pattern designer of knitting storybooks Phoebe’s Sweater, Freddie’s Blanket, and Phoebe’s Birthday, as well as knitting book Green Gables Knits. She lives in a little house with big shelves full of books, fabric, and yarn in Loveland, Colorado, with her illustrator husband, Eric, and their three children. The Johnsons own and operate Slate Falls Press and are always dreaming up more book ideas.